Do I have some form of adrenal fatigue? It is easy to understand why I might suspect adrenal fatigue. I have consumed a lot of coffee in the past 20 years. I even run a website called INeedCoffee. Maybe I’ve gone too far and have adrenal fatigue? I needed to find out more about this topic so I read the go to book on the topic. 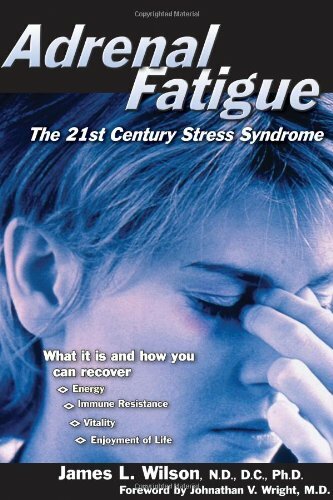 Adrenal Fatigue: The 21st Century Stress Syndrome by James L. Wilson covers the topic of adrenal fatigue thoroughly. The more I read the book, the better I felt. After reading the symptoms that other people experience, my life seems pretty sweet. The case studies made me seem like a Buddhist monk. I took the adrenal fatigue quizzes in the book, which asks you to answer for both your current state and for the past. Probably the time in my life where I exhibited the most symptoms of adrenal fatigue would have been when I lived in the Washington DC metro area, which was late 1998 to mid 2000. It was the dot-com days and the traffic was killing me. The results of the quiz had me at low borderline for adrenal fatigue then. Today I am not even close. Improving my sleep, fixing my diet and exercise has had many spill-over positive effects that have made me more resilient. I also consume far less caffeine today than I did back then. And I still drink 3-4 espressos plus tea now. Back then I was drinking 5-6 large mugs of french press coffee plus tea and cola. My life and experiences are different than yours. If you suspect you may have adrenal fatigue, check out this book and do the quizzes yourself. The second half of the book has excellent tips for dealing with stress that could be benefit anyone, not just those with adrenal fatigue. the traffic in and around DC would be enough to severely stress anyone out. I think you mentioned you have severe headaches, right? Dr. Oz recommended some health-food store stuff called Feverfew as a reliever. Maybe look into it. @thomas – Tried it already. Had it daily from August 1st – September 24th. It is worthless. Great points and fantastic that you took some of the proper steps to reduce the risks of adrenal fatigue. You’re right, Wilson’s book should be read by everyone. Some small fixes to diet and overall lifestyle habits can make a huge difference to enjoying a more energetic (and hopefully longer!) life.